White Cyclone is due to close on January 28th, 2018. MestnyiGeroi, peep, Gazza and 1 other person like this. This has a lot of potential, nice to see RMC broadening their horizons too. They need to also get their hands on Regina and, especially, Jupiter. Intamin have built some real s**t in Japan. Nooooo! I love White Cyclone. It was so lame it was actually hilarious, just bouncing round the track. Never laughed so much on a woodie before. We had a fab night ride on it just laughing the whole way round. Seriously though, this is exciting news, seeing RMC spreading their wings into Asia. I hope White Cyclone still looks as gorgeous when they finish. 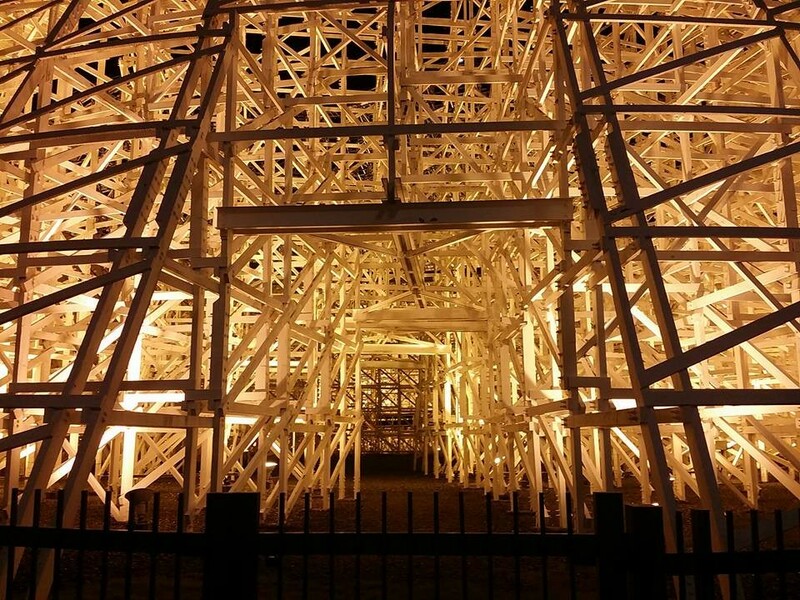 RMC do sometimes have a habit of making things looks a bit ugly and I've always thought WC looks fab, especially all lit up at night (a bit similar to American Eagle at SFGAm). I'm sure I'll still be happy though as I doubt they'll make many changes to the base structure. Hopefully it'll retrain its traditional white paint too. White Cyclone is absolutely dreadful so this is great news! How did rcdb get this scoop? It's been reported by numerous sources. Kinda hoping it's just topper track since it looks really impressive as it is now. Maybe RMC could do some alterations to the layout to make it more intense instead of just all out Iron Horsing it. The fact that they're saying "closing temporarily" makes me wonder if it is actually an Iron Horse treatment since parks tend to say "closing permanently" if that's the case. But that all depends on what they're reopening it as and by saying 'temporarily' they're inferring it's making a return and that it's not going away forever. Which for their market isn't the worst thing they can do. It won't be closing that 'temporarily' - it's closing for at least a year. Also, this is a Japanese park - lets maybe not read too much in to their English statements? You don't want them to just topper track it, White Cyclone is and needs to be Iron Horsed. Slightly more bothered about Spite Cyclone now. Would have liked to try it in the original format. They need to also get their hands on Regina and, especially, Jupiter. Don't touch Jupiter just yet, your review makes me deeply regret skipping it. With its gorgeous white supports and fairly interesting layout/footprint I am very excited. Wonder what they'll do with those gigantic helixes. I'm confused... What am I missing from that POV? Doesn't show up on the forum Pear just the video title in Japanese. 【here we go! Let 's enjoy LASTRAN at last ! Curtain down the history of about 24 years 1/28 # end ! In March 1994, # debut was wooden # coaster " # white cyclone and the sales of" to end January 28, 2018! Coaster white whirlwind "White Cyclone" that runs at 1,515 m, the upward and downward shape of a camel like a camel, at the maximum speed of 102 km / h! # Nagashima Spa Land new dimension of # hybrid connects the dream to the coaster! In the spring of 2019 I will make it the first domestic new coaster to combine wood and steel! A new type of hybrid type coaster appears The design is planned to become a wonderful coaster that exceeds the maximum speed and the tilt angle of 50 degrees, which is the twist of drilling rotation (transverse rotation), which could not be realized only with wood alone. Look forward to the latest coaster in Japan that wood and steel (steel) fused together! Is that hinting at inversions? 'which is the twist of drilling rotation (transverse rotation)', or merely stating that it can perform manoeuvres that normal woodies couldn't? Of all the layouts they've remastered, this is the largest right?